The 21 day fix diet has made a name for itself as one of the best ways to lose weight in a short period of time. In just 21 days, you can lose a significant amount of weight by eating portioned controlled meals and consuming plenty of nutritious foods from each food group! The wonderful thing about the 21 day fix eating plan is that you don’t have to deprive yourself while you’re on it – you can still eat delicious meals, including overnight oats! Overnight oats are extremely tasty, and will help keep you satisfied and energized throughout the morning. Take a look at our favourite 21 day fix overnight oats recipes to fuel your day! What is the 21-Day Fix Diet? If you’re wondering how to get started on the 21-day fix diet, it’s simple! You’ve already made the first step: deciding you want to live a healthier lifestyle. The first thing you need to do is figure out your calorie intake. To find your calorie intake, multiply your current weight by 11 and add 400 (this covers the calories you burn during your daily workout). Here are our best tips for getting started on the 21 day fix diet! 1. Weigh and measure yourself before starting so you can keep track of your progress over the 21 days. Don’t go crazy weighing yourself everyday, but it’s good to have a benchmark to start off from. 2. Preparation is key. Buy your supplies and foods ahead of time and look up recipes you’re going to make for the week. This will make it easier to stay on track with your weight loss success! 3. Get your meal prep containers! A big part of the 21 day fix diet is using the meal prep containers, which are listed above. Whatever fits in the containers, you can eat! Filling up on lean protein like chicken and veggies like spinach will help you stay full, but the great thing about the 21-day diet is it’s not restrictive so you won’t feel deprived. 4. Exercise. There are a number of 21 day fix workouts you can do, and the program recommends 30 minutes of exercise per day for best results. 1. Veggies such as kale, collard greens, spinach, squash, sweet peppers, cauliflower, eggplant, snow peas, cabbage, mushrooms, onions, bamboo shoots and celery. 2. Fruits including berries, guava, passion fruit, bananas, oranges, cherries, grapes, mangoes, peach, pineapple, figs, and peaches. 3. Proteins like fish, boneless, skinless chicken and turkey breast, lean ground red meat, goat, shellfish, eggs, kefir, plain Greek yogurt, tofu, tempeh, cheese, veggie burgers, turkey bacon, and protein powder. 4. Carbs including sweet potatoes, quinoa, beans, lentils, edamame, peas, brown rice, wild rice, refried beans, potatoes, barley, whole grain pasta, whole grain pita bread, whole grain waffles and pancakes, whole wheat and corn tortillas. 5. Healthy fats such as avocados, nuts, hummus, coconut milk, goat cheese, feta cheese, parmesan, and other cheeses. 6. Flours like coconut flour, brown rice flour, chickpea flour, almond flour, oat flour and wheat flour. 7. Extras including nut butters, olive oil, coconut oil, pumpkin seed oil, organic butter, seed butters, unsweetened almond milk, unsweetened cashew milk. 8. Sweeteners like honey, molasses, maple syrup, agave, and stevia. The 21 day fix diet is one of the best ways to lose weight and maintain weight loss! These tips and recipes will make it easy for you succeed with your weight loss goals! 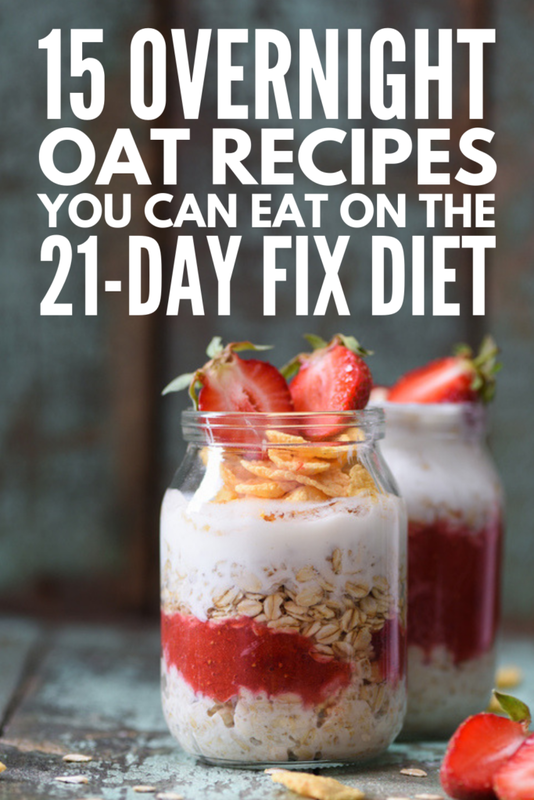 If you loved this post on 21 day fix overnight oats recipes, please share it on Pinterest! And if you’re looking for more 21 day fix recipes, make sure to follow our Health board on Pinterest!